Marbles! 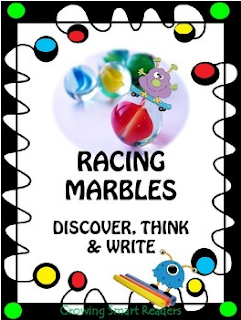 Discover, Think and Write: A STEM activity that will get your kids rolling marbles up and down pipes and tunnels that they make on their own. Marbles and noodles have been around for awhile! But the fun doesn't go out of style! This is a popular activity that's been around for a long time. In fact, you have probably seen those pins on Pinterest. I had planned on an activity like this for my summer camp. But I did not have a lesson plan or follow up writing activities to go with this fun activity, so I created this lesson packet, which integrates science and literacy. This is physics at its most playful stage...Kids won't know they're actually learning a little physics as they play around with tubes, noodles and marbles. Of course, you can create your own lesson plan with objectives to make this an engaging activity. But if you want a shortcut, and if you're tight on time, try this. Easy to differentiate--for a range of skill levels! This marble-chute activity is bound to keep your kids engaged. Try cardboard tubes or swimming noodles. For really young kids, you may want to do the questions orally, or have them write and illustrate their discovery. Students in grades 3 and up may want to try the worksheets, or you may want to design your own questions. Integrate literacy and science/technology with this fun resource. Racing Marbles is a 100% interactive lesson for problem-solving and working collaboratively with one or more students. Team work is essential, and cooperative learning is an inevitable outcome. First, students plan a chute or track for marble racing. This is a great time to recycle materials to make the chutes! This is fun during the school year or during your summer program. Students will collaborate and problem-solve, evaluate, modify and revise ideas and techniques. Together, they can work to solve problems and then share their results. After all the excitement, they can share their results orally. Finally, independently or in pairs, students can fill out the question sheet, which also asks them to make a change in the diagram given. No wrong answers. But kids must have reasons for any change which they must be able to state in writing. Learning opportunities abound with this interactive literacy/science lesson. Vocabulary can also be introduced just prior to this activity. Relevant vocabulary/definition cards are included. *creative problem-solving (open-ended solutions) and much more! Hyper-linked Common Core Standards are listed in the document. Anchor Standards are listed for speaking and listening since a lot of the student participation involves oral communication skills. Writing standards are listed for grades 3 and 4. Guaranteed to keep 'em engaged, busy, and challenged. I hope your kids have a "MARBLE-ous" time with this project-based lesson.